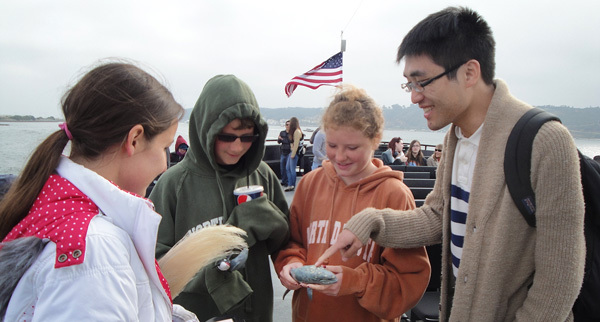 Study abroad student Phil Shu (right) and two other eager learners investigate gray whale specimens with volunteer naturalist Courtney Ocheltree (left). A blanket of coastal fog is clearing as whale watching boat Marietta edges out of San Diego Bay. Higher-than-expected waves catch many passengers off guard, but the surprise seems to bring this group of strangers closer together. Two young men on the bow are engaged in an amusing debate as to whether or not they feel seasick. One of them flags me down for a second opinion. After chatting for a few minutes, I learn that Phil Shu is one of several study abroad students on board from Grossmont College. “I am from China and am studying psychology in San Diego for one year… I have been to all the major cities in California,” he says, grinning. As the Marietta motors west, I gaze at the horizon and envision how far Shu has traveled. With an unlimited fuel supply, we could (hypothetically) head west from San Diego, along the 32°parallel, and reach his home country. China is out there somewhere….across this vast Pacific Ocean, which covers one third of the planet and is larger than all the continents combined. To date, visitors from six continents and 38 countries have joined Birch Aquarium and Flagship Cruises & Events for whale watching this season. A mile north of Point Loma, we spot a blow. This gray whale is sneaking along the kelp forest edge, its head barely breaking the surface when it breathes. The passengers are also taking slow, shallow breaths, waiting for the whale to reappear. Everyone clusters together, hugging the rail with cameras at the ready. I walk around the crowd, my ears vigilant for foreign languages. French here, a little German over there. Italian, che bello! Is that Vietnamese? I am humbled by the number of languages I don’t speak. And yet, there is meaning in a warm smile or an arm around a spouse’s shoulders; even squabbles among siblings. These are universals we all understand. Storytelling is another way we all communicate, and on the boat, accounts of other U.S. states and distant countries are told daily. Through our passengers’s memories, I have worked as a travel writer and dined at some of the finest cafes in London. A blue whale has breathed in my face and a pod of orcas has surfaced behind my boat. I have walked along the shores of Lake Baikal in Russia, where the only freshwater seal lives. Rain has soaked the floor of my house in Mongolia. Perhaps this is why people enjoy discussing travel so much—we get the chance to revel in someone else’s adventure. And, in a small way, that person’s experience becomes part of our own. Birch Aquarium volunteer naturalist Anne Alcorn (right) explains the structure of gray whale baleen to the Aberl and Marsh families of Paradise, Texas, and Corinth, Mississippi. Marietta is returning to San Diego Bay. Near the mouth, a bait ball has begun to form, attracting the attention of hungry common dolphins and Brown Pelicans. Overhead, chattering Caspian Terns survey where to dive amidst the commotion. Three excited kids jump up and down, pointing at a V-formation of cocoa-colored cormorants flying in from the south. At the start of the tour, most passengers had not seen a whale outside of captivity. Some had never been on a boat before. But now they have direct experience with whales and the open ocean. Soon, we’ll approach the dock and our guests will head their separate ways. But these travelers will take stories of the Pacific Ocean home with them—to Argentina, Portugal, Iran, and New Zealand. 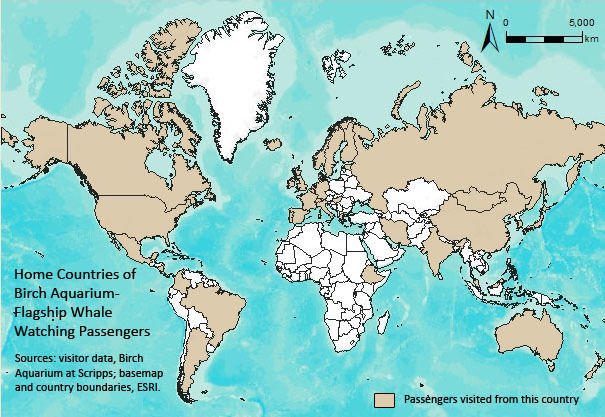 Whether a person lives in a country with bold conservation policies or weak ones, passengers disembark with a heightened sense of adventure and empathy for ocean wildlife. Is this appreciation for the living world strong enough to cross state and international boundary lines? Can we reconcile cultural differences for the greater purpose of valuing our common humanity? If Birch Aquarium’s whale watching passengers were a model for the world, I would say: maybe…maybe we can. 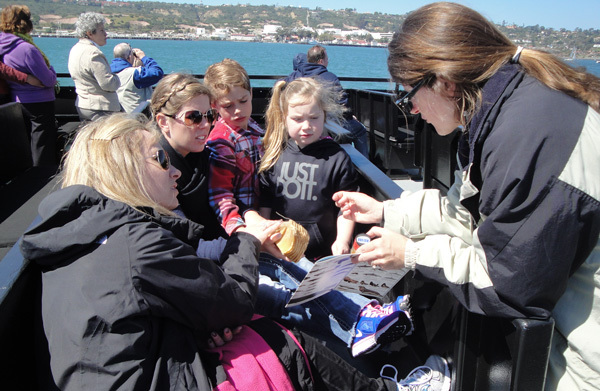 Daily whale watching cruises with Birch Aquarium at Scripps end April 14. Cruises leave at 9:45 a.m. and 1:30 p.m. from Flagship Cruises & Events at 990 N. Harbor Drive in downtown San Diego. 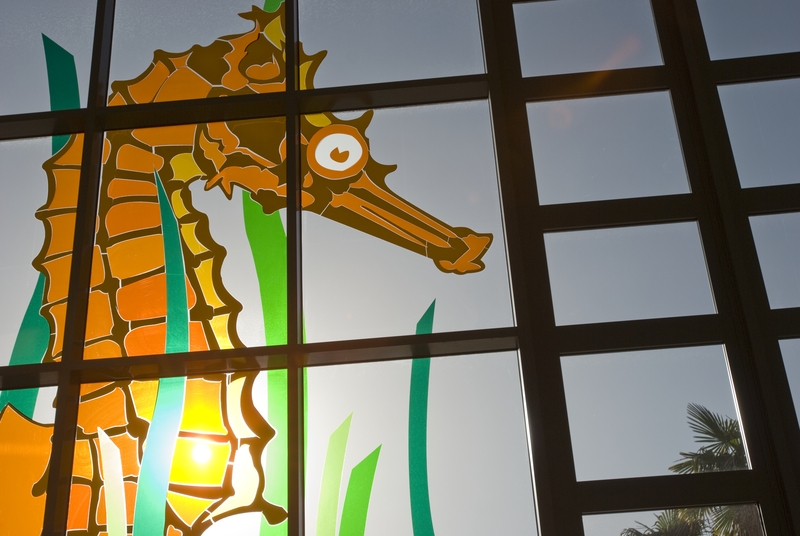 For more information and to download a $5-off whale watching coupon, visit the Birch Aquarium Whale Watching page. Kate, Aside from being a great naturalist/guide you are an equally great writer. This is my seventh season of Thursday mornings on the Mighty Marietta. While the goal is to see whales and the other wonders off our coast, it is the experience of meeting the visitors and sharing their stories, experiences and wonderment. Language seems to be no barrier to communication on the boat. It makes for a memorable Thursday, regardless of weather, sightings and the vagaries of the sea. Thanks.